No words. Just go for it. I appreciated the good security. I did not like any of the 4 breakfasts offered as I like more protein and better nutrition for meals. White rice & white noodles have poor nutrition. Staff were very friendly & helpful. A large, well run hostel with many amenities, convenient to metro station to Central. Great room, nice staff, but the location is a little far out. Subway is only a few minute walk though. Overall had a fairly good stay here. Very clean, good facilities. There were a few smaller details that were a bit off (no plug on top bunk), and no water machine to fill up a water bottle (you had to buy a new one each time). Also the room of 8 people is a lot to fit in the room but as long as your hostel roommates are polite should be a good stay. Need to take the metro to get most places but the front desk is very helpful with teaching you how to use public transportation. I think this has the potential to be a great hostel but has a lot to improve. The facilities at the room were not great. Basic bunk beds, no reading light, no curtains, and no plugs on each bed. Basic details like squeaky lockers and the sink of the shower was always blocked shows the hostel needs to focus more on the travelers experience. And it was not cheap, average usd32 a night. Location is good, with a train station 5 minutes walking in non touristic area. It can look unsafe but its not. 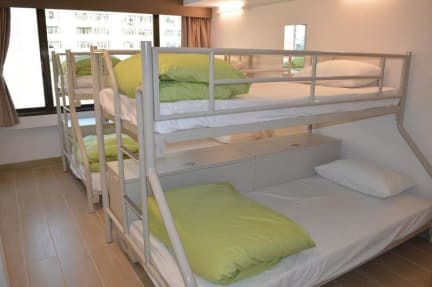 I can’t give this hostel any good ratings because I never got there. I booked 5 months in advance, and 4 days before I was due to get there the hostel emails me saying that my security deposit has been declined and I need to send them my bank details over email so they can update it. Obviously not doing that. Then they said if I didn’t they’d give my room away. I rang the hostel and they couldn’t find my booking anywhere. They couldn’t see it in cancellations either. No room and no refund given.